It has been far too long since you last heard from us, and for that we apologize. Over these last many months, we have been evaluating the future of Unbucket. In short, it is with a heavy heart that we announce Unbucket will no longer be in active development. While your support has been tremendous over the years, we have determined that our prospects for turning Unbucket into a sustainable business are not sufficiently strong to continue. Speaking candidly, it has been a heartbreaking lesson in the disconnect between what you know in your bones to be possible and what, in reality, time and resources allow you to achieve. Always looking forward, whether Unbucket exists as an application tomorrow is not nearly as important as you, our incredible community, actively continuing to live your lives to the fullest in the company of those you love. Through this, the spirit of the Unbucket mission will live on forever. From the bottom of our hearts, we would like to sincerely thank you. Over these past few years, you have inspired us with your aspirations, motivated us with your constant support, and have given us an incredible education in the classroom of human possibility. We couldn’t have asked for a better group of people to join us on this journey. P.S. As a practical matter, Unbucket will stay online for the foreseeable future and your lists are safe for now. If and when Unbucket goes offline, you will receive an official notice giving you ample time to take appropriate action. Long before we moved to Los Angeles, we lived in a climate that had four distinct seasons — and spring was our favorite. Spring mixes two emotions: the relief that winter has finally been laid to rest and the anticipation of summer and all the fun and serendipity it promises. Using their content as a guide, these lists are meant to help you refresh all elements of your home life, from the bedroom to the kitchen to the food you cook for dinner. Check them out below and click “Start This List” to make them your own. 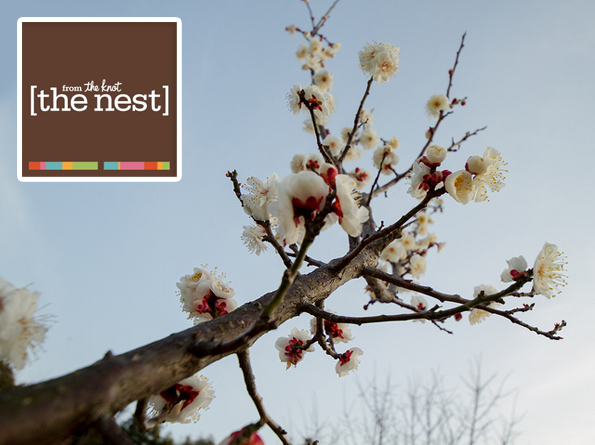 May this spring be your best, and may your intentions blossom into experiences like never before. Welcome to the latest post in our Closer series — a look at how technology brings couples, family, and close friends closer. 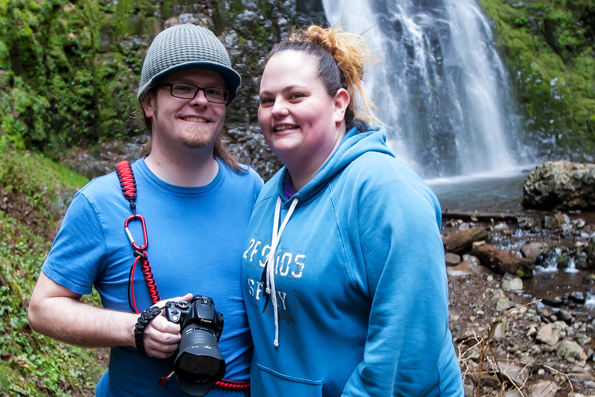 Randall and Marta are a couple living in Portland, OR. On any given day you can find Randall tinkering with robots, Marta learning to code, or the two of them planning a line of sardonic home decor. Unbucket: How has technology brought you both together? Randall: Without technology we never would have met! [Laughs] We met originally…it would have been Yahoo! wouldn’t it? Marta: This was around the end of 2004. I was in the College of Pharmacy program at OSU. It was my freshman year and it was the first time on my own with a laptop and everything. My roommate and I would just hang out on random chat rooms and stuff, and one day I got a random message from Randy because he was back in the area from OIT in Klamath Falls and was just trying to find friends in the area. That’s when we started chatting. Unbucket: What did he first say? Marta: I think he just said something like, “Hey, wanna chat?” It was something really generic. [Both laugh] Our first three months were all chatting. Unbucket: What did your friends think about the online-only relationship at the time? Randall: Perceptions from my circle were markedly different as I had met my ex-wife on the internet on ICQ back in 1998 [laughs]. Not quite as shocking on my end! Unbucket: When did you finally meet in person? Unbucket: So how does technology bring you closer now? Marta: We’re pretty much on Google Chat talking to each other all day long. [Both laugh] Doesn’t matter where we’re at or what we’re doing, we’ll just message each other. We both kind of get to it as we can, since I’m at work all day, but there is this constant line of communication. Randall: That’s definitely a biggie. Instant Messenger has been with us too even though it isn’t nearly as popular as it used to be. We haven’t really wandered over into the realm of using Facebook chat or anything. Unbucket: Do you interact at all on Facebook? Randall: We don’t really use public posts on Facebook as a direct communication medium. Things we post to Facebook are treated specifically to be shared with everyone. Marta: We’ll make comments on each other posts or post something like, “Hey check out this funny thing I found.” It’s not a “Hey, I need to talk to you” type of thing. Unbucket: What are your individual thoughts on privacy and technology? Randall: My personal philosophy is that if I’m not comfortable with whatever it is I’m posting being known in public, it doesn’t go across the wire, period. If I’m putting it online, I make sure it’s something I’d be comfortable with anyone knowing! Marta:I think we’re losing the ability to keep certain things a secret, which I think is good, because there is sort of this mindset of, “I can keep this and no one will know about it,” but you know, “I could tell this person, but no one will know about it.” We didn’t have ways to communicate with millions of people previously, and now, you can just in three seconds tell the entire planet your deep, dark secret. Unbucket: You each have very different relationships with technology. How do you influence each other? Marta: He is my only tech friend, the rest of my friends are in no way tech savvy. They can barely use their cell phones. My ability to know anything I know just baffles them. So all of my tech experience comes from things I’ve learned from Randy or things I’ve seen him do. Marta: I’m his test bunny! [Both laugh] I know a little bit, but I don’t know as much as he does, so he’ll see how I use something and ask me questions about it and see what my thoughts are. I’ll ask questions about stuff that him and his ultra-tech mind don’t actually think about [laughs]. Randall: She gives me a really good gut check. When I’m checking out new products and whatnot that I’m all sorts of “gaga” over and think it’s amazing, I have her check it out to see if the feeling is relatable. Unbucket: Marta, you’re now actually learning how to code. What inspired you? Marta: I think it’s from watching all the stuff Randy does with code, seeing the results of it, and realizing it’s really fun making something do what you want it to do. He has showed me tons of resources and helps me figure things out. Unbucket: Has this shared learning experience brought you closer? Randall: Watching her go through it, you get to discover all over again the potential of coding. Unbucket: As a society, is technology bringing us closer or driving us apart? Randall: I definitely have to say both. In a lot of ways it can be a distraction, but ultimately, it’s just another communication tool. It’s very much up to the individual to use it wisely. From a designer’s point of view, we have a responsibility to make sure our work encourages positive interaction. Marta: I think it’s bringing people closer together, but I don’t think people realize it. There is so much negative attention because the average person doesn’t realize that everything they post on the internet is in fact public, so they’re having moments like, “Well that wasn’t for you to see!” or “That was just for these people!” or you know, “You can’t see this picture!” But in reality you can, because it’s on the internet. So it’s bringing everyone closer together, because everyone knows about all the good and bad, whatever it is that you’re putting out there. You need to make a choice of, “Do I want this out there?” or “Do I want to keep this to myself?” It’s bringing us together, but people need to pay attention to it and learn more about it to use it in a positive way. 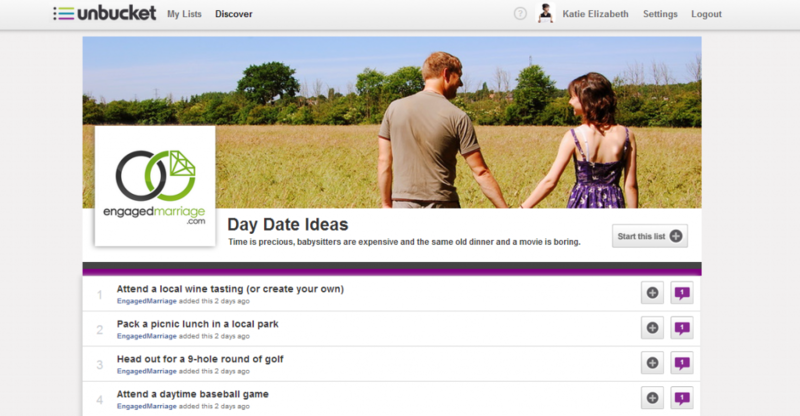 Today, we open Unbucket to the public after concluding a closed beta period launched at the beginning of June 2012. By far the most rewarding part this endeavor has been interacting with you, our ever-growing community of people that use Unbucket. You have shared hundreds of ideas for making Unbucket better, you have inspired us with thousands of list items and you have carried our cause across six continents and over 100 countries. Together, we are shaping a web that doesn’t just connect us digitally, but a web that brings us closer together in the real world too. We’re extremely excited to announce that today we are joined by eight partners that equally believe in this vision. They have lent us their expertise, original content and passion to create lists to inspire offline action among our community and their own. We will not rest until everyone shares an Unbucket list with someone he or she cares about deeply, and every organization shares with Unbucket a list of things it cares about deeply too. Finally, some of you may know that Unbucket stemmed from a Mother’s Day gift (Read here). We’d like to take this opportunity to dedicate the launch of Unbucket to the memory of Brian’s mother, Marilyn Berman, who touched the lives of so many in indescribable ways and will forever be missed by all. This series highlights the amazing group of organizations and individuals contributing to our first set of branded Unbucket lists. We felt their investment and belief in what we’re accomplishing together warranted special recognition. As happy as we are to see people adding items to Unbucket lists that we describe as “small, near, and soon” — like visiting a local park — we’re always impressed when we see some truly ambitious items too. Our dear friend Sayra Morán’s list “What a beautiful life, what a beautiful life” comes to mind. But what if your idea of ambitious list items involves pushing the physical and mental limits of human endurance? We’ve partnered with one of the best resources out there for inspiring you to do just that. Nerve Rush is a premier source of information for extreme sports and adventure activities. They document endurance races, interview athletes and write about the world’s highest mountains. They also produce downloadable guides for tackling endurance challenges written by world-recognized experts. 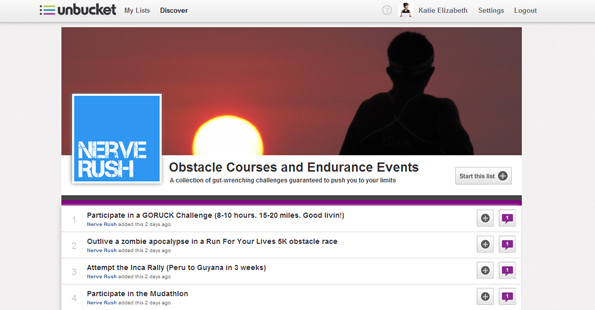 Our first Unbucket list collaboration with Nerve Rush is titled: Obstacle Courses and Endurance Events. Just completing one of these would be considered ambitious by anyone’s measure! We look forward to many more opportunities to collaborate with Nerve Rush, and we hope our first list item inspires you to challenge yourself in the company of those you care about most. Alan is the self-styled Chief Gut-Wrenching Officer of Nerve Rush and a primary contributor to the site. He has been to over 60 countries and counting. Alan is also a dear friend of the Unbucket founders. 1. Why were you excited to work with Unbucket? I like Unbucket’s philosophy. A traditional “bucket list” – adventurous places to visit, foods to try, iconic experiences to partake in – is isolated and somewhat limiting. By sharing your own lists with friends and family, and by exploring what other lists people create, this whole notion of taking control of one’s life, of living a life of adventure and purpose and seizing the day, all of it, becomes more approachable, more fun, more emotional. 2. Can you share a personal experience with a Nerve Rush x Unbucket list items? Guess who hasn’t completed any of the items the list? THIS GUY. My personal experiences come from interviewing and speaking with the various individuals who have participated in races like the Inca Rally, the GORUCK Challenge and the Tour D’Afrique. Having them contribute their stories to the Nerve Rush community is as close as I’ve gotten to some of the wild feats of endurance these athletes have encountered. That said, I did just sign up for the New England Tough Mudder – we’ll see how that goes! 3. In what way does Nerve Rush bring people closer? One of our primary missions at Nerve Rush is to deconstruct the world of extreme sports, endurance events and obstacle races and to make those sports and activities more approachable to the masses. So, with our content, we bring our readers closer to the athletes, closer to the sports and closer to these super cool fringe activities like proximity flying and walking across America. Lately we’ve been conducting more video interviews which has allowed us to inject a bit more personality into the Nerve Rush brand. I see that trend continuing quite a bit. Some of you might not know this, but the genesis of Unbucket was a mother’s day gift. Mother’s Day was approaching, and our co-founder Elliot Darvick decided to mail his mom a list of things to do together over the year to come. With Elliot and his mom living thousands of miles apart, this list brought them closer in ways regular phone calls to catch up did not. That Mother’s Day gift sparked the idea that everyone should have a list to share with someone they love. Months later Unbucket was born. Will Schwalbe and his mother also shared an unconventional, yet truly meaningful gift: a two-member book club of which they were both members. Will’s mother, Mary Anne, had been diagnosed with advanced pancreatic cancer in 2007. Accompanying his mom to a chemotherapy treatment, Will asked her: “What are you reading?” That question led the pair to form their own book club where over the next two years, they read and discussed a wide variety of books, and discussed the fabric of life, and ultimately death. The experience inspired Will to write the New York Times Bestseller The End of Your Life Book Club. A chance meeting between Elliot and Will revealed complementary visions sharing a common inspiration. Their chance meeting resulted in the creation of two Unbucket lists full of suggested reading inspired The End of Your Life Book Club: 10 International Books & 10 Life Lessons. It’s Will’s hope that you’ll form your own two-member book club with someone you love. It’s Elliot’s hope that you’ll use Unbucket to capture what you want to read, what you’ve read, and inevitably, memories from the deep discussions that follow. 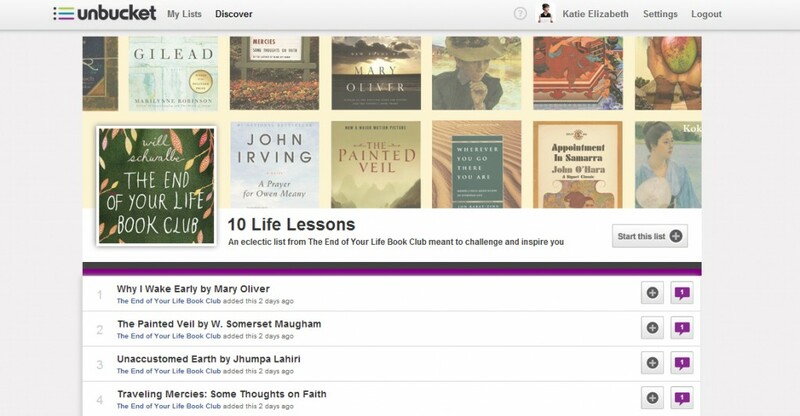 In addition to authoring The End of Your Life Book Club, Will Schwalbe is the founder of Cookstr.com and former SVP and Editor in Chief of Disney’s Hyperion Books. Will also serves on the Boards of Governors of Yale University Press and the Kingsborough Community College Foundation. 1. What excited you about working with Unbucket? I was tremendously excited to work with Unbucket from the moment I heard about it. As the world gets more and more high-tech and we all spend more and more time communicating through machines, I think many of crave opportunities to interact with each other in small groups. I love how Unbucket uses on-line communication to power and facilitate an unlimited range of experiences of all different kinds. And I’m a compulsive list-maker and list-sharer — so it’s like it was made for me. And even though I started by creating lists of books, I’m really excited to create and share hybrid lists as well, maybe tied into books — combining things to read, eat, see, and discuss. 2. How do you see The End of Your Life Book Club bringing people closer? I used to think that a book is the greatest gift in the world. I know believe that it’s the second greatest gift — the greatest one is the conversation you have about a book with someone you love or with someone you don’t know well but want to get to know better. We all are a combination of so many things, but for those of us who are readers, we are partly made of all the books we’ve read. When we share those books and our thoughts about them, we’re really sharing our deepest selves. This series highlights the amazing group of organizations and individuals contributing to our first set of branded Unbucket lists. We felt strongly that their investment and belief in what we’re accomplishing together warranted special recognition. We like to believe that an Unbucket list is the antidote to a boring relationship, a string of promises to live an active life in the company of each other. Indeed, we’ve seen many different types of couples using Unbucket, from couples living in the same city plotting out future dates to couples living thousands of miles apart dreaming of future days spent together. It was in this spirit that we originally approached Dustin Riechmann of the website Engaged Marriage to share Unbucket with his community, which he graciously allowed us to do. When the time came to seek out partners for Unbucket’s launch, we immediately turned to Dustin, this time to create something special to share with our own community as well. Engaged Marriage is a brilliant play on the word “engaged” that inherently asks, “Shouldn’t we remain engaged even after we’re married?” To quote Dustin, “I understand it’s a very real struggle to find time to devote to improving your married life. I know how it feels to struggle to even keep up with the everyday requirements that we face as couples in the earlier years of our marriage. I know it’s hard. But I also know that it’s totally worth it.” It’s this realistic yet hopeful approach that permeates everything Dustin shares with his Engaged Marriage community. This approach also captures the ethos Unbucket strives to embrace, which is why we’re so excited to share our first collaborative Unbucket list with Engaged Marriage: Day Date Ideas. Whether you are dating, engaged, married, or engaged and married, we hope you’ll use Unbucket and Engaged Marriage as two resources to enhance and grow your relationship, and we’re looking forward to sharing with you many more future collaborations. Dustin is the founder and main contributor to Engaged Marriage, inspired by his own experiences as a father and husband. In addition to being an expert on relationships, Dustin is a trained civil engineer. At Engaged Marriage, we’re all about experiences. A shared experience with your spouse or fiance doesn’t have to take a lot of time or cost a lot of money to have a real impact on your relationship and bring you closer. That’s what I love about Unbucket – it’s an amazing place to come explore and live out experiences together. 2. Can you share a personal experience with an Engaged Marriage x Unbucket list item? Our first Unbucket list is all about helping couples get out an enjoy a Date Day – which of course changes things up a bit from the traditional date night of dinner and a movie. My wife and I have done just about everything on the list at some point (mostly before our three small children were around). A favorite of ours is the day trip to the zoo…without kids in tow. We live near St. Louis, and we have a fantastic zoo that’s right in the heart of the 1,300-acre Forest Park. It’s hard to beat a spring afternoon spent exploring the zoo, followed by a pedal boat ride and a small lunch in the park. 3. In what way does Engaged Marriage bring people closer? We provide content and tools that help busy couples live intentionally and enjoy their married life to the fullest. While we cover everything from money to productivity to intimacy, the common theme you’ll find at Engaged Marriage is practical advice that will improve your life with just a small investment of your time. I’d definitely encourage the Unbucket community to come over and join our free newsletter to get some fun and helpful resources for their relationship. Don’t just stay married…get engaged! Almost a year and a half ago when Unbucket was just an idea, a good friend of ours, Michael Kaliski of Good Planet Media, passionately made the case to us for what he called, “Unbucket for Good.” His vision called for non-profits and forward-thinking brands to use Unbucket to inspire action in the name of making the world a better place. Michael’s vision inspired us and we committed that day to making “Unbucket for Good” a reality. As Unbucket progressed, we reached out to multiple non-profits in the L.A. area to gauge their interest in using Unbucket as a platform to inspire action. Craig Prizant, Senior Director of Development & Marketing at TreePeople, immediately responded to our call and generously gave his time and feedback to us to help shape our approach. For those not familiar, TreePeople is an environmental nonprofit that unites the power of trees, people and nature-based solutions to grow a sustainable future for Los Angeles. When the time came to select a launch partner to represent our first Unbucket for Good initiative, Craig immediately opened the door to partnering with his wonderful organization, the results of which we’re thrilled to share with you today in the form of TreePeople’s first Unbucket list: Simple Steps to Grow a Greener City. Working with TreePeople is especially meaningful to us. The Angeles National Forest is frequently a place of respite for us when we need a break to reflect and regroup. Our own childhood summers were spent surrounded by the pine trees of Wisconsin and the cherry trees of Northern Michigan. This is a very special time for TreePeople too. The year 2013 marks their 40th anniversary and the unveiling of a very ambitious goal: to involve one million people in the Los Angeles area over the next ten years in transforming their homes and neighborhoods to be greener and shadier, and to create a secure supply of clean, local water. We hope this is the first of many partnerships together aimed at achieving this goal, making ecosystems in Los Angeles and beyond healthier and more sustainable for all. Lisa Cahill is the Director of Sustainable Solutions for TreePeople where she inspires and educates others about the simple steps they can take to transform their landscapes. Lisa first began her work with TreePeople as a volunteer Citizen Forester and continues to volunteer in this capacity. She most enjoys working in the garden with her husband, watching her children and vegetables grow. Unbucket seems like a great opportunity for TreePeople. We are very excited to be a part of their team. They helping us promote our work and creating another route for people to find out about all that we do here at TreePeople. 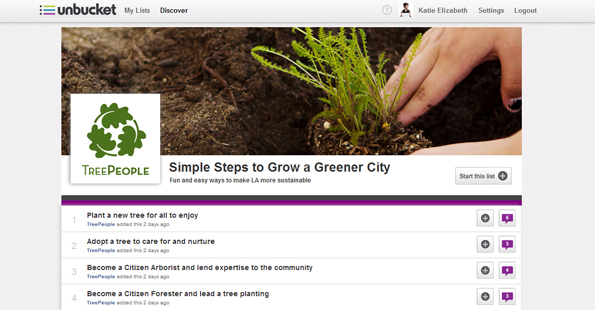 The ability to share with friends and inspire each other is so much of what our work at TreePeople is all about. 2. Can you share a personal experience with a TreePeople x Unbucket list item? I started with TreePeople over 12 years ago as a Citizen Forester. The trees outside my home are a constant reminder of the incredible work that TreePeople has done all over the city and the actions we inspired all over the world. Since then, I’ve headed up a few different plantings in my community and at my children’s school. With our friends and neighbors my Citizen Forester plantings have planted and helped care for about 150 trees. My children see this every day. I think it helps them believe in me on days when I am not such a prefect parent, and more importantly, it shows them what one person can do. I know it gives them faith in themselves. It shows them dedication and confidence that one action does matter. And they are learning the value of giving, community and hard work. I cannot think of any better gifts to give to my daughter and my son. 3. In what way does TreePeople bring people closer? These epiphanies were so amazing to me, each time they happened. Of course, it’s why we have our name…TreePeople…but it is about much more than that. People love trees. No matter their politics, their culture, their upbringing…we are all connected to nature. And although we can sometimes lose track of that, the road back in is so easy. Just by planting a tree, by caring for it and watching it grow, we remember the value and the vital role we play as stewards of the earth. We find that we cannot do it all alone. And we are supported by the community around us as we inspire each other to do more. It’s really amazing! And I feel that is what Unbucket is trying to bring to us, too. Simple, fun ways to connect and celebrate! When creating Unbucket lists and adding items to experience, we often encourage our community to think “small, near, and soon.” It’s not that we don’t believe people should keep Unbucket lists comprised of exotic places and ancient wonders to visit in a lifetime, it’s just that often, if we’re willing to look, incredibly rich and rewarding cultural experiences are waiting for us in our own backyards. Think about the local theater company or progressive art gallery or basement concert venue; regular exposure to the experiences these institutions offer can lead to a very fulfilling life, even if your passport remains in a drawer for much of it. It’s why we’re so excited to announce that two of our launch partners are champions of promoting these types of local cultural experiences. The first to approach Unbucket was Columbia, Missouri’s Office of Cultural Affairs. According to Money Magazine, Columbia is the thirteenth most highly educated municipality in the United States. It’s home to the University of Missouri and is often referred to as College Town USA. 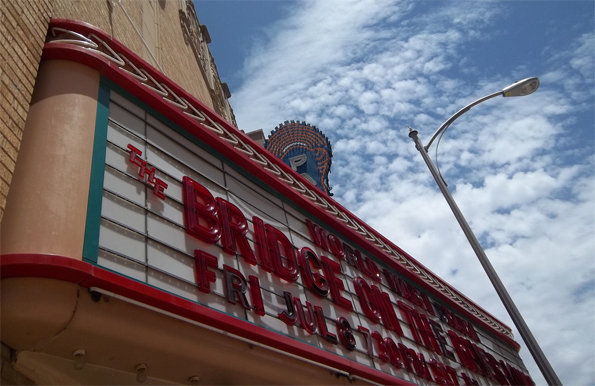 It has a thriving downtown, and hosts numerous cultural festivals each year. We’ve always believed every city should use Unbucket to promote local attractions to both residents and tourists, and we couldn’t imagine a more perfect partner than Columbia, Missouri. It’s with great pleasure we share with you their first two Unbucket lists: Engage the Stage: Attend Great Performances in 2013 & Deepen your arts experience. The second partner to approach Unbucket was CNY Arts, a Central New York organization that works to enhance the arts and cultural environment of the region. In particular, what we love about CNY Arts is their IDEAS Collaborative. Created two and a half years ago, the IDEAS Collaborative was established to help arts and cultural groups in the region pool resources and share marketing initiatives. The Collaborative’s charge to promote a wide variety of cultural experiences in centralized and innovative ways made them a perfect fit for Unbucket. It’s with great pleasure we share with you their first Unbucket list: Arts & Cultural Activities to Enjoy around CNY. Wherever you live, whether it’s Columbia, Missouri or Syracuse, New York, we hope these lists inspire you to seek out a rich life made of the best your local cultural institutions have to offer. Sarah is a Cultural Affairs Specialist for the city of Columbia, MO and key part of ensuring the success of the city’s art-related activities. 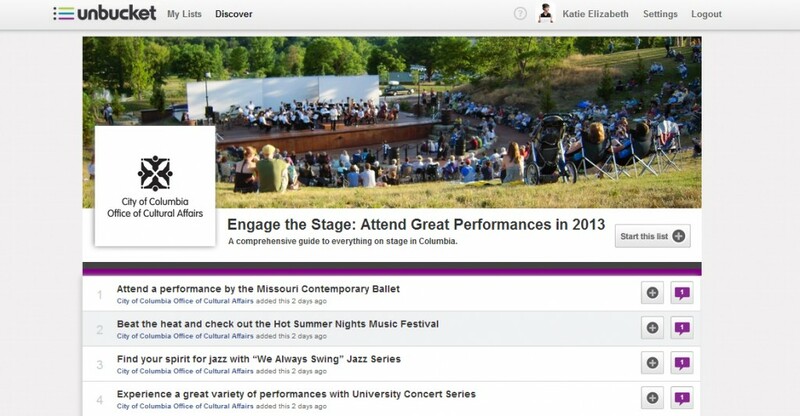 When I first heard about Unbucket, it seemed like a great tool to get people motivated to go out and experience the arts in Columbia. Encouraging community-wide awareness, participation, and investment in the arts is a priority for the Office of Cultural Affairs. This past year, we have really tried to be more connected through social media and innovative marketing. Being able to work with Unbucket to create lists will add a new level of engagement to our current efforts. I’m excited to see people start using our lists, create their own, and get other cultural organizations in Columbia involved. 2. Share a personal experience with one of the items on your Unbucket lists. Even after living in Columbia for many years, I continue to be surprised by the number of new experiences I can have. This might be attending a unique, one-time event or inviting a friend to see a performance in a concert venue that is unfamiliar to me. I remember the first time I attended a jazz performance presented by “We Always Swing” Jazz Series. It was several years ago, and I got the last two tickets to see pianist Brad Mehldau with his trio at a Sundays @ Murry’s concert. Being able to see a top jazz performer an intimate setting and sharing the experience with those around me is something I will never forget. I must have truly found my “spirit for jazz” because I have been back to several “We Always Swing” concerts at Murry’s and other venues, and each time I feel like I’ve learned something new. 3. How does your work with the Office of Cultural Affairs bring people closer together? One of our goals is to encourage people to participate and invest in the arts. This could be going to a music concert, a theatre performance, or a gallery opening. It could be taking your children on a self-guided tour of all the publicly accessible art in Columbia. Maybe it is signing up for an art class. In all of these examples, people are sharing an experience. We hope that by becoming more involved in the arts in Columbia, people will foster deeper relationships within the community. Matthew is the IDEAS Project Manager at CNY Arts where he engages audiences to broaden overall arts and culture participation in Central New York area. Matthew is also an artist himself with a particular interest in video as a medium. We have so many great arts, cultural and heritage assets covering a six-county region in CNY. I’m always looking for new ways to engage with our community that encourages further participation in the arts. It is also very important for us as it is with many organizations to find opportunities to reach out to new people to become involved with the arts. 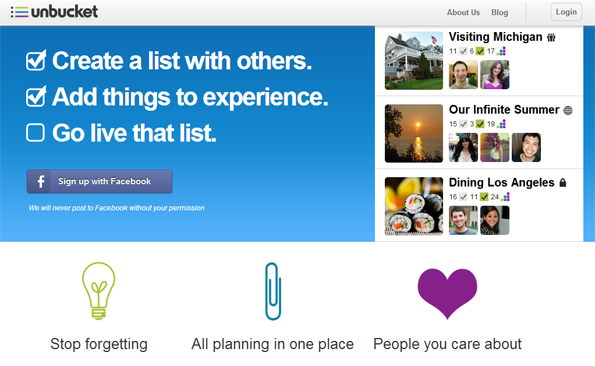 I really liked the idea of creating lists online that leads to offline engagement. 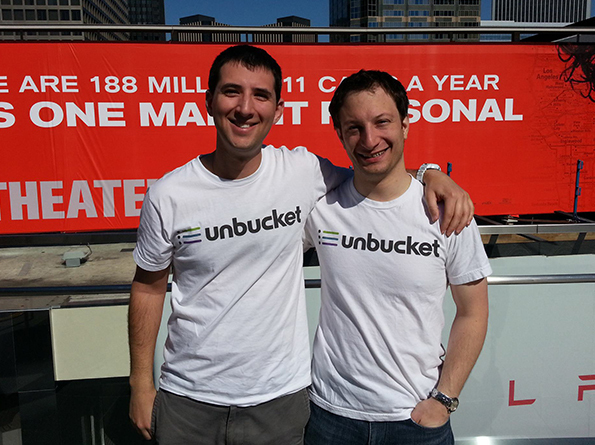 So when I first heard about Unbucket, it seemed a great fit for what we are trying to achieve. Unbucket is a great way to engage and bring people together to enjoy the great opportunities we have in CNY. 2. Can you share a personal experience with a CNY Arts Unbucket list items? I have done almost everything on the list I made over the past several years. But one of my most recent experiences was at ArtRage Gallery. There was a photography exhibit where people took images of his or her neighborhood. The night that my partner and I went, was also a night that the gallery was hosting a potluck dinner and giving out art awards. I was going to leave, as not to disturb their event, but they welcomed us in, told us to enjoy the exhibit and when we were done, they asked us to stay for dinner. I met a lot of great people that night and had a wonderful experience. That sense of community is something that is very common throughout the arts community in CNY. 3. In what way does the work you do bring people closer? 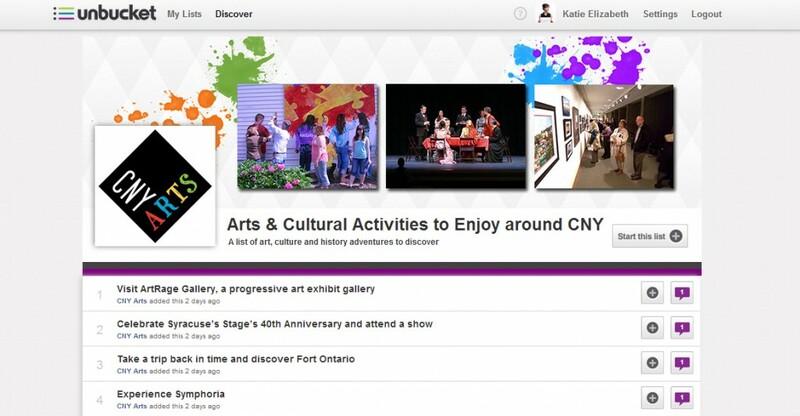 CNY Arts is driven by the idea of connecting arts, culture and community. My role, particularly with the IDEAS Collaborative is to foster greater collaboration among arts and cultural groups with the goal to increase participation and outreach in the community. I use social media to share knowledge and encourage people to share their experiences and engage with others both online and off. Using these tools is a great way to bring people together to experience the arts. That is why I’m excited to incorporate Unbucket in our strategies to bring people together in fun ways that will strengthen the arts and cultural landscape in CNY. A great ambition of Unbucket is to turn online content into offline action. Unbucket envisions a world where crossing the gap between reading something interesting to do and committing to doing it is as seamless as clicking a button. The first step is turning great content into Unbucket lists for our community and the communities of the content creators to live out in real life. When the opportunity arose to work with the website HelloGiggles to do just this, we were beyond excited. omg. ARE YOU KIDDING ME. hold on things are nuts ill be calling you back in a sec. hello GIGGLES. HELLO GIGGLES? aka one of the sites i visit EVERY DAY. as in ZOEY DESCHANEL????????????????????? We hope you enjoy the lists, we hope you enjoy the artwork, and we look forward to bringing you many more collaborations between Unbucket and HelloGiggles. Michelle Escobar is a regular writer for HelloGiggles. Of note, she has contributed numerous interviews to the Women Working to Do Good is a series, a collaboration between HelloGiggles and the White House. Michelle is an aspiring comedy writer living in Los Angeles. When I first heard about Unbucket, my gut reaction was, “Why hasn’t this existed before? !” This website is perfect to keep track of the things you want to do that’s out of your ordinary routine, which everyone should be doing. I love watching a film I’ve been putting off because of work, and when I do, I check it off and feel I accomplished something productive. 2. Can you share a personal experience with one of the HelloGiggles x Unbucket list items? 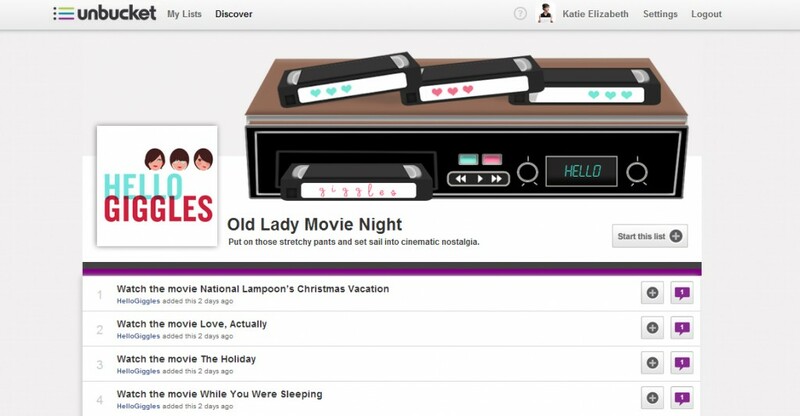 My favorite HelloGiggles x Unbucket list is definitely the Old Lady Movie Night list. It really has some classics that I know I should watch but haven’t had the time. The list has “While You Were Sleeping,” which I had completely forgotten how much I loved! Yes, it’s a chick flick, but it’s a great flick. It also brought back memories of when I first watched it with my friends in school. 3. In what way does HelloGiggles bring people closer? HelloGiggles brings friends together and also helps you meet new friends. HelloGiggles is all about building a community of strong, independent women (and men, too)! I feel these lists will allow our readers to meet up with friends, new and old, and share new experiences that will help them bond, create memories and become better friends.